Here's something to cheer us up. 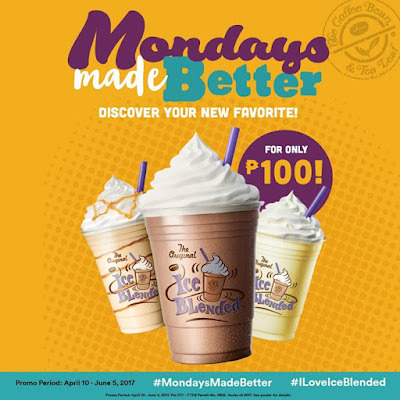 You'll definitely look into the first day of the week with Coffee Bean and Tea Leaf's(CBTL) Happy Mondays Promo. Every Monday of the week from until June 5, 2017, can purchase any of the CBTL featured beverages for ₱100 only. Coffee Bean and Tea Leaf will announce the featured beverage Friday prior to the Monday Made be Better Promo Day. This promo started April 10 of 2017.